Photographer H G Moulden, Hitchin. Elizabeth Impey was Secretary of the Hertfordshire branch of the Women’s Social and Political Union (WSPU). Elizabeth’s husband Arthur also supported the movement and was part of the ‘Men’s League for Women’s Suffrage’ with the aim of bringing the electoral power of men to the women’s cause. In 1907 Elizabeth was arrested for disorderly conduct whilst attending a WSPU demonstration. She was walking side by side with linked arms with a friend when a police officer asked them not to do so. They refused his request three times and were arrested and sentenced to 14 days in Holloway Prison. On her return to Hitchin, she was snubbed by friends and received hate mail, and her home in Whitchurch Road was stormed by hundreds of anti-suffragette protestors. 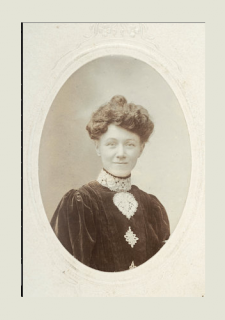 More determined than ever, she organised visits by prominent suffragette leaders and caused riots at political meetings, sometimes having to be smuggled out of the crowd by side entrances by police. In 1958, she attended the centenary celebration of the birth of Mrs Pankhurst at the House of Commons, wearing the suffragette scarf she had with her when arrested 50 years earlier.